Not sure what you mean by "why are these same number on different cards?" Which cards have the same numbers? They seem to be from the same molds and stencils, but with different card makers' names on them and only the latter have the cartomantic writing, so even if they were from the same print-run, they would be different copies of the deck. No, not the original French text. 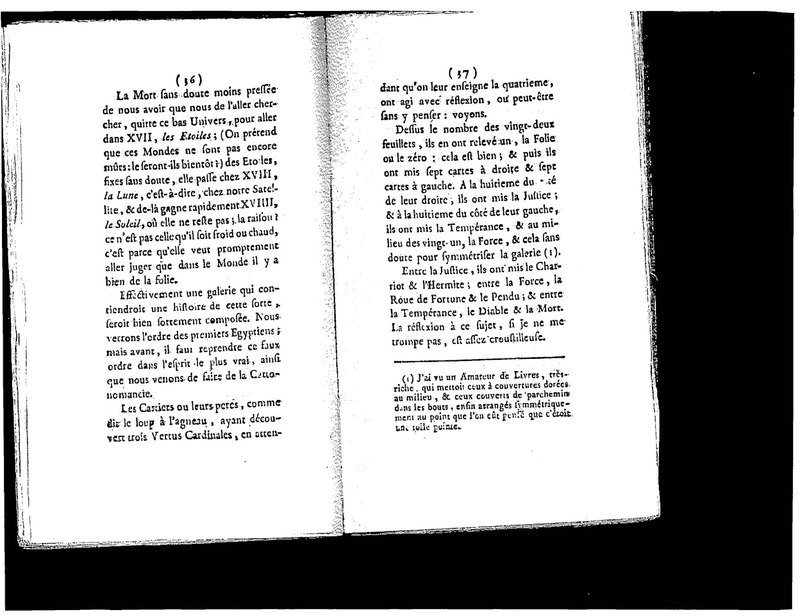 DDD say, footnote 33, p. 273, "Jean-Baptiste Benoist worked until around 1783 (T. Depaulis, "Maitres cartiers strasbrougeois", Le Vieux Papier, no. 312 and 312)." The reference to Etteilla himself is their 1785b, pp. 34-5, and fn. 1. 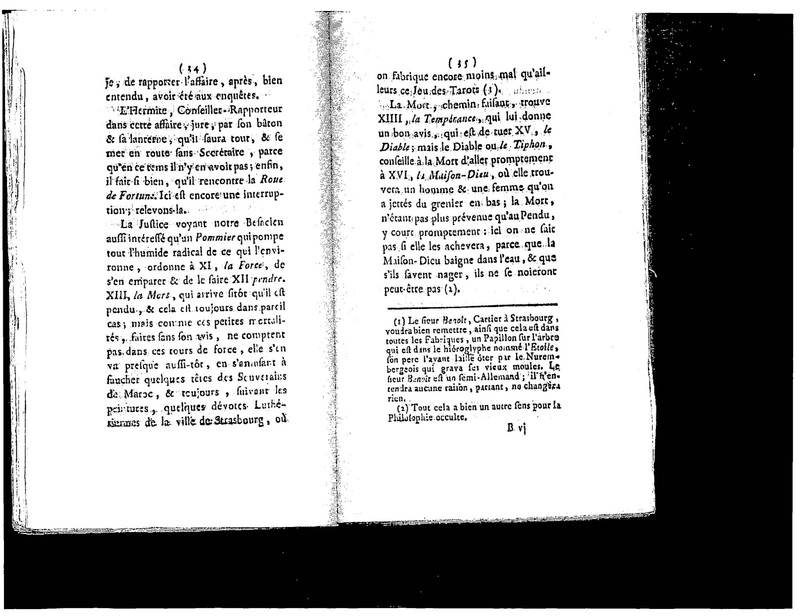 Their bibliography only lists one work for 1785, the 2nd Cahier. I do have that one, in xerox (thanks to Cerulean back in 2012 or so). He only mentions "le sieur Benoit". Here is the page.https://4.bp.blogspot.com/-c9rHCvU2nbo/ ... ge_020.jpg. 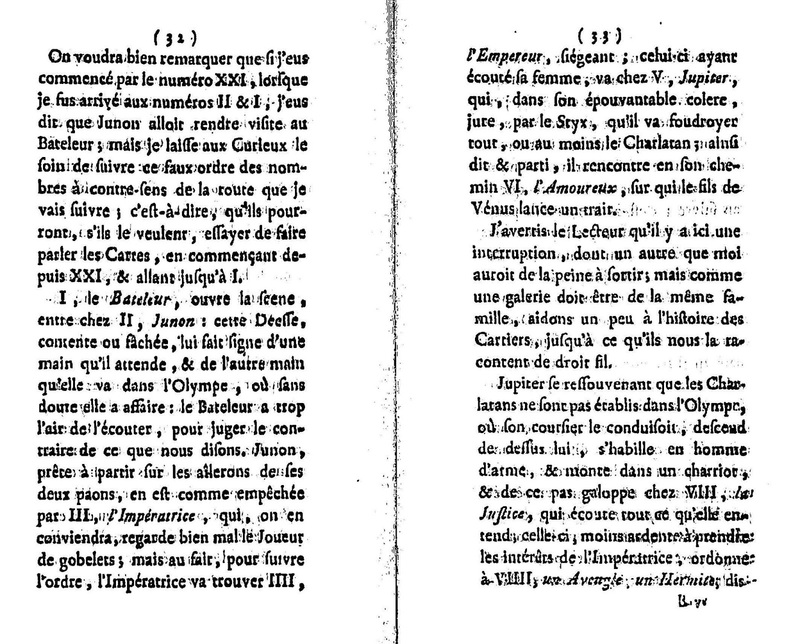 So the primary source for Jean-Baptiste in particular seems to be Vieux Papier. The resolution isn't very high, but it seems good enough that Etteilla could have seen it there, whether it is really there or not. Etteilla's butterfly is also yellow, and beneath a tree, at least near a bush. I have seen reference to J-B being everything from 1720 to 1820, Allemagne says 1791-1818 - struggled to find a definitive answer! "The four of coins is devoted to good Fortune, portrayed in the center of the Tableau with her foot on her ball & her veil deployed." Thierry Depaulis wrote in 2010 an article "When (and how) Tarot reached Germany" (IPSC 39/2, starting p. 64). The article is excellent, it helps here to develop a basic line of German/Austrian Tarock development. This was my source. Do you have the article? I attempted to look it up, but I don't know, where it is gone to. MikeH knows a way to look older articles up. Thanks for straightening me out on the identification of the two decks with numbers. Yes, they are quite different. 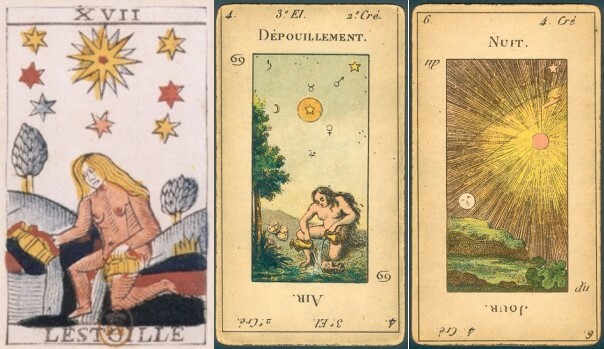 But they do correspond to the two types of variations on the Tarot de Marseille which Etteilla uses as evidence that the ignorant card makers have changed everything from what it was and nothing nowadays is trustworthy. I do not know any deck where the Pope has changed to a "Spadassin", as he says is another mutation, but perhaps he means the Flemish decks with Capt. Fracasse (http://www.tarotpassages.com/vanden2.jpg) and Bacchus. But he does not seem to know about their Hanged Man reversed like his. 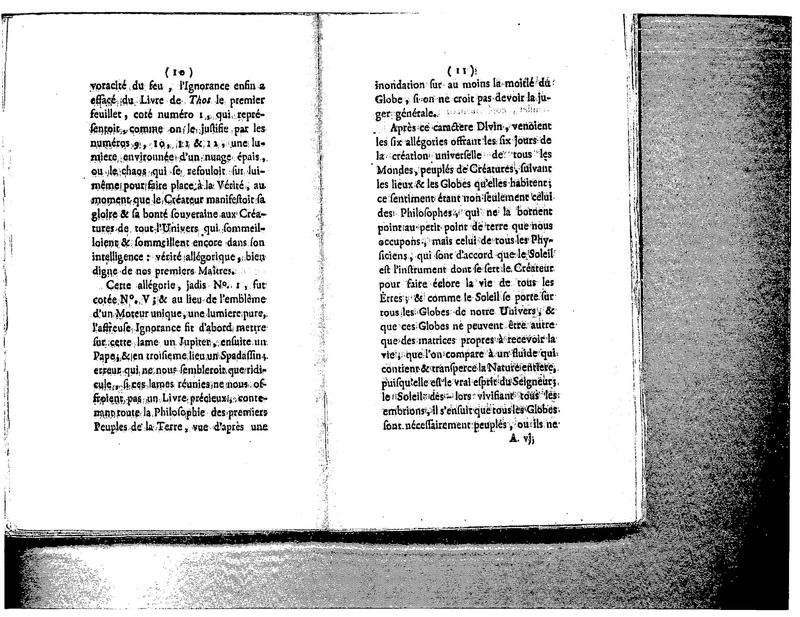 He says in the paragraph on p. 20, "que nous avons dit"--as we have said. He has talked earlier of this switch from first, Jupiter, to second, Papa, to third, Spadassin (and which he will now restore to card 1), but doesn't say any more than that (https://2.bp.blogspot.com/-xPLp3fa8gXM/ ... ge_006.jpg). before starting on his own "rectified" version at the bottom of p. 39. But you might take a look. The only specific detail of interest that I can see is his complaint that this particular deck is missing the butterfly. 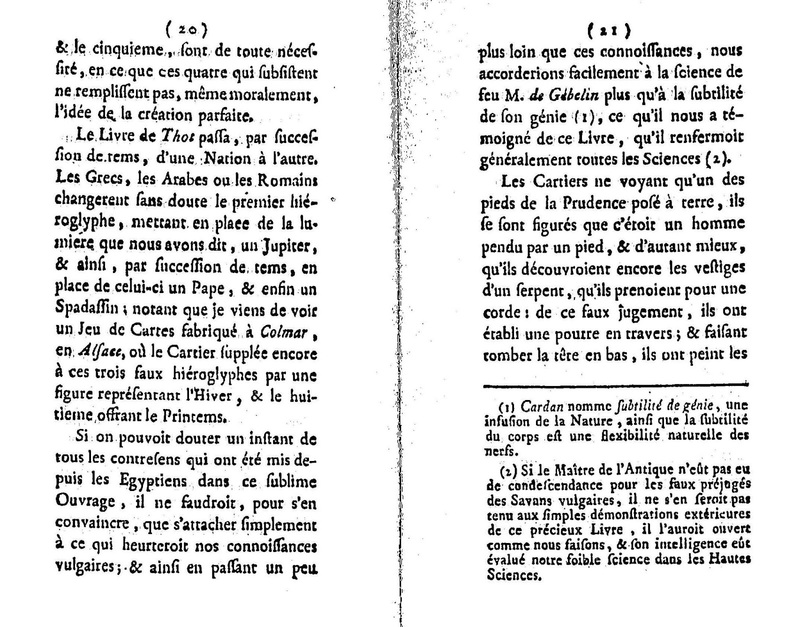 So either he saw another deck very like that one that did have what he imagined to be a butterfly, or he is merely kowtowing to Gebelin, who after all is one of the royal censors at this time, 1783, when he is submitting the manuscript for the second time, after being first disallowed. Or both. These two references combined seems like more evidence that these particular examplars with the numbers were once owned by Etteilla and survived for that reason. Perhaps you can find something in his descriptions that points to Isnard/Benois in particular. So he does mention a few more decks! Tourcaty is Tarot de Marseille. Laurent is Jean-Pierre Laurent, described with sample cards at http://secretsdutarot.blogspot.com/2013 ... ancon.html. For the quotes in your last post, Steve, what are the page numbers? Also, it would seem that you are cutting and pasting from a text file of the book. If so, it is pretty good. Is it online somewhere? My Google won't give me anything except listings, but it works differently in different places. A searchable version would be handy to have. 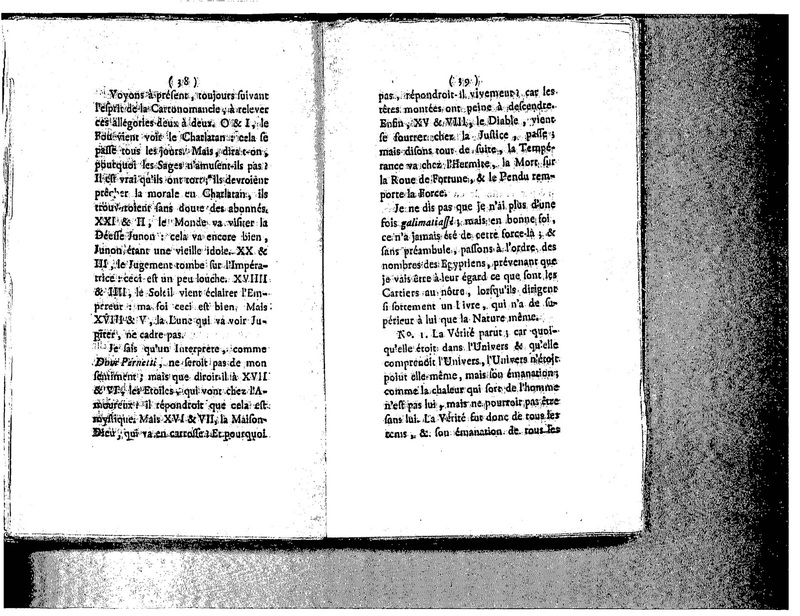 "a "pseudo-TdB (tarot de Besancon)". It does contain "Junon" & "Jupiter" cards (titles are omitted, though), but all the other cards are in Tarot de Marseille "type II" style. The reason why it has J & J cards should lie in the location of Belfort.